The beginning of the end of Europe's QE is here. 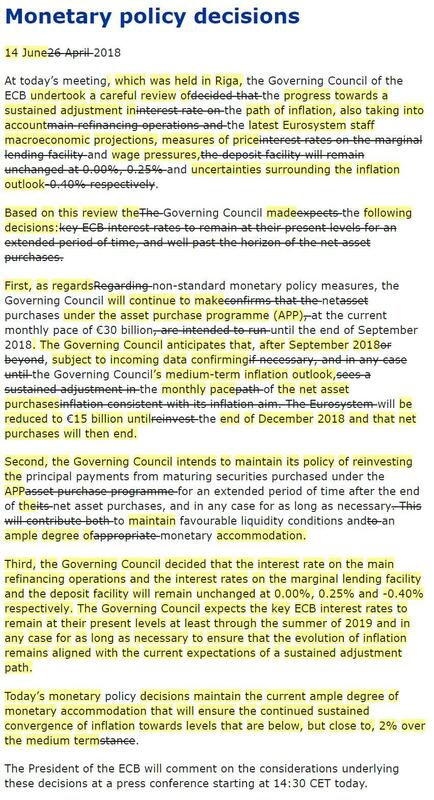 As extensively previewed, jawboned and leaked, the ECB - which kept all of its rates unchanged as expected and as the ECB detailed, remain unchanged until the summer of 2019 - ended the drama over the end of its QE, and moments ago announced that while "the Governing Council will continue to make net purchases under the asset purchase programme (APP) at the current monthly pace of €30 billion until the end of September 2018, after September 2018 the monthly pace of the net asset purchases will be reduced to €15 billion until the end of December 2018 and that net purchases will then end, all of which of course is "subject to incoming data confirming the Governing Council’s medium-term inflation outlook." Second, the Governing Council announced it intends to maintain its policy of reinvesting the principal payments from maturing securities purchased under the APP for an extended period of time after the end of the net asset purchases, "and in any case for as long as necessary to maintain favourable liquidity conditions and an ample degree of monetary accommodation." This was known from before so it is not news. Finally, the Governing Council surprised with a little bit of forward guidance, and announced that while its kept rates unchanged (i.e., the interest rate on the main refinancing operations and the interest rates on the marginal lending facility and the deposit facility will remain unchanged at 0.00%, 0.25% and -0.40% respectively, as expected), the surprise in the statement was that the ECB will keep rates at their present levels at least through the summer of 2019 "and in any case for as long as necessary to ensure that the evolution of inflation remains aligned with the current expectations of a sustained adjustment path." So the bottom line: a hawkish QE announcement with an even more dovish rate hike delay. After a knee-jerk move higher, yields and the euro starting to subside on the announcement of a taper and strengthened forward guidance, or as we previewed moments ago, "with everyone confident that one thing will happen, i.e. the EUR will spike, don't be surprised to see the EUR tumble."